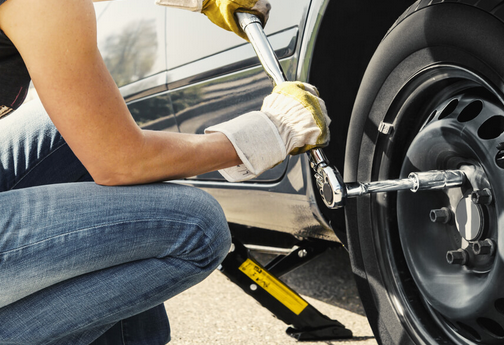 The one tip that every driver should know, regardless of age or gender, is to be able to change a flat tire on a car. This is a problem that many younger drivers and female drivers have it that they have never been taught the correct way to change a tire, so they panic and spend valuable time and money by calling someone to fix something that is very basic. One thing that all drivers must keep in their car is the original manual that comes with the car. Not only will this give a step by step guide on how to change a tire, but it also contains other important information pertaining to your vehicle. 1. While many times you cannot choose where to park, it is best to park in a paved area that is as flat as possible. If you are on a busy road, try your best to pull into a parking lot or gas station as this will usually give you a good surface to operate in. After parking, you should put your safety hazards on and shut your engine off. Also make sure to put on your parking brake if you have one, as this will prevent the car from rolling. 2. 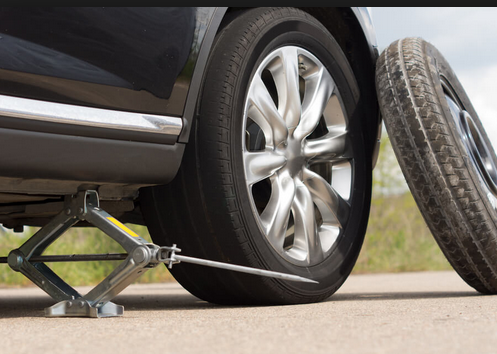 The most important part of this process is to apply a wheel chock behind your tires to prevent rolling of any kind. If you do not have one, don't start the process. Look for a large rock or another object that you can use to put behind your wheel to prevent your car from rolling or collapsing. DO NOT change your tire if you can't do this part as you could get severely hurt or even die if your car rolls on your or someone else. 3. Pop off your hubcap if you have one and loosen the bolts with the lug nut. Make sure to loosen these good, but do not remove them at this point. 4. After loosening all of the lug nuts you can then place your jack under the car, make sure to refer to your owner's manual for the best place to put this as it may be different for different vehicles. Jack your car up so that you have enough room to put on a new tire without it touching the ground. You can now loosen the lug nuts all the way and remove the tire. 5. After removing the flat tire you can then place the spare tire onto the lug nuts. When you tighten the lug nuts make sure you do them alternating so that the tire is even on the car. Tighten the lug nuts so they are on the firm and they the tire is in place. 6. After you have the tire on all the way you can then lower the jack and remove it from your vehicle. Make sure that once your car is on the ground that you tighten each and every lug nut as hard as you can to make sure the wheel is on tight. 7. After this, your car should be ready to drive. Remember, if there is any shaking or if your tire is not on properly that you must start this process completely over. If you do this and continue to have problems it is best to call a more knowledgeable person or take it to a mechanic as there may be a problem with a different part of the car. Changing the flat tires, no problem! Don't You?